OTB is a rather invisible enterprise, lurking in the underbelly of New York City. This is the type of place that caters strictly to a niche clientele and those not seeking to place bets through the city's Off Track Betting parlors, will probably never notice there existence. This is one of the few things in New York City that I do not consider a must see. In fact, the atmosphere is rather unsavory, perhaps seedy. Unlike racetracks themselves which have the added elements of horses, paddocks, jockeys and an outdoor environment, OTB is stripped of all these human and equine elements and has reduced horse racing to a betting experience. Although one can feel some excitement at the close of a race, there is the distinct sense that the excitement is largely predicated on winning money with a leveraged bet. Unfortunately, It is also the home to many the disenfranchised hoping to hit it big, with a longshot or perhaps a gimmick bet like the exacta or trifecta. 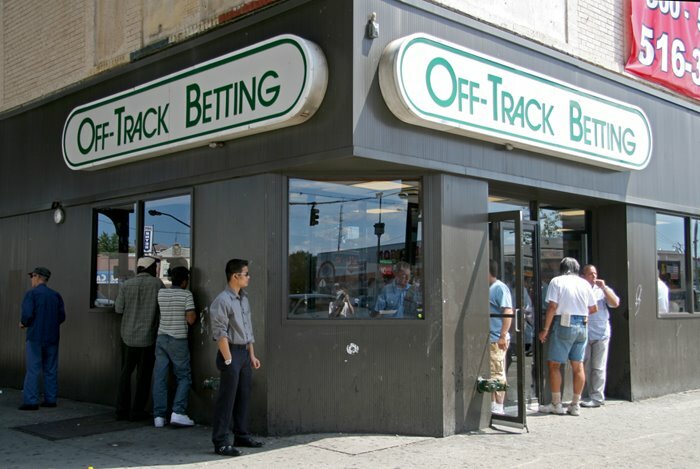 History of OTB: Approved by voters in a 1963 referendum, the official history of the New York City Off-Track Betting Corporation began on April 22, 1970. NYCOTB was designated to operate as a public-benefit corporation, a relatively new form of governmental entity run along the lines of a private enterprise whose profits accrue back to the taxpayers in the form of public revenue. The mission given us was three-fold: to raise needed revenue for the City and State, to combat organized crime's hold on gambling by providing a legal alternative and to help New York State's racing industry.